New Zealand has imposed diplomatic sanctions on Israel over the activities of two alleged members of the Israeli intelligence agency, Mossad. The Israelis were sentenced to six months in prison for trying to obtain New Zealand passports illegally. Prime Minister Helen Clark said that such acts by what she called Israeli government agencies were a violation of New Zealand sovereignty. The Israelis, Uriel Zosha Kelman and Eli Cara, deny working for Mossad. 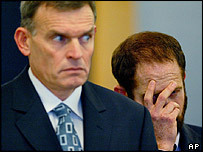 They did plead guilty to attempting to gain New Zealand passports illegally and working with organised criminal gangs. In a statement to the Auckland court trying the men, Ms Clark said she would suspend government visits to Israel, Israeli officials would need visas to enter New Zealand and foreign ministry contacts would be suspended. Her government is also planning to refuse any request for Israel's President, Moshe Katsav, to visit next month when he is due in Australia and delay its approval for the appointment of a new Israeli ambassador to New Zealand. Ms Clark said she had no doubt the two men were Israeli intelligence agents and that the case was "far more than simple criminal behaviour by two individuals". She said the case had "seriously strained our relationship" with Israel. New Zealand had asked Israel for an explanation and an apology, but had received neither. An Israeli Foreign Ministry spokesman said he was sure that Israel could repair the diplomatic damage and re-establish good relations with New Zealand, but did not specify how the Israeli government would go about it. A BBC correspondent in Jerusalem, David Chazan, says Israeli officials give the impression of regarding New Zealand as a relatively unimportant country. Sources close to the government say the Israeli reaction might have been different if a larger and more influential country had been involved. The two Israelis were arrested in March after they tried to collect a passport in the name of a New Zealand national who is a wheelchair-bound cerebral palsy victim. Trying to obtain a passport fraudulently carries a maximum penalty of five years' imprisonment in New Zealand. News agency reports say the two Israelis received lighter sentences because they pleaded guilty. They also agreed to donate ($A50,000) $US32,700 to a local cerebral palsy charity.